The latest victim of the United States crackdown on online gambling payment processors was Ahmad Khawaja, who ran the payment processors Allied Wallet and Allied Systems. The case began over a year ago when federal prosecutors seized some $13.3 million in funds from the companies account at Goldwater bank in Scottsdale Arizona. The funds were traced back to the popular online poker room PokerStars, and from there the case was made. Khawaja settled out of court on Tuesday, forfeiting the $13.3 million that was seized. The Civil Forfeiture Complaint for the case stated that the funds constituted proceeds of operating an illegal gambling business that were deposited between January 2009 and May 2009, and that the funds were traceable to PokerStars, as well as other online gambling sites. 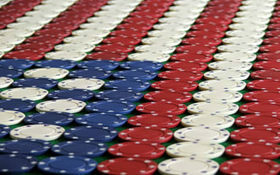 Unable to prosecute the online poker rooms themselves –both because they operate offshore, and at this time it’s unclear what US laws they are breaking—the US Government has stepped up the pressure on payment processors, starting with Douglas Rennick and now Ahmad Khawaja. This entry was posted on Thursday, August 19th, 2010 at 1:47 pm and is filed under Poker News. You can follow any responses to this entry through the RSS 2.0 feed. You can leave a response, or trackback from your own site.